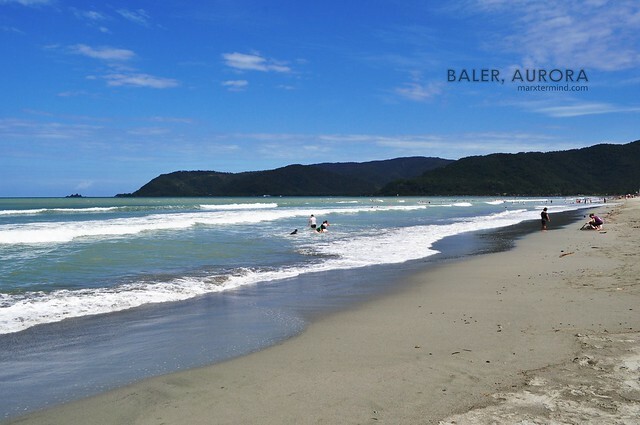 Baler is now one of the places that is continuously becoming popular as the next travel destination. Located in the province of Aurora in the island of Luzon, Baler is a first class municipality of the province and also the provincial capital of it. It is situated 230 kilometers northeast of Manila which is accessible by bus or private cars with 6 to 7 hours travel time. 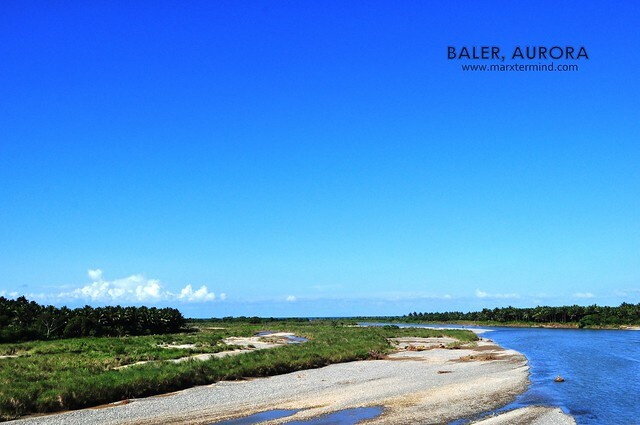 Actually I wasn’t familiar of the place, Baler, until I saw it on a Filipino movie with the same title. I was fascinated by the movie, how the place looks like and its history. From then on, I included it on my list of places to go. So to finish my curiosity about the place Baler, me and my friend planned a trip to Baler and to experience anything Baler has to offer. How to get there? The only bus that goes directly to Baler from Cubao is Genesis Transport. But since it was Holy Week then, there were no regular operations of buses to Baler so we opted another route to Baler which is via Cabanatuan. We rode an ES Transport bus to Cabanatuan from Cubao. Fare costs about PHP 185.00 with approximately 2 hours travel time via SCTEX. We reached Cabanatuan by 2:00 AM. Since it was Holy Week, there were no regular transport to Baler. Good thing, a jeep was available that time going to Baler. With no hesitation at all we rode the vehicle and traveled the road via jeepney. The fare costs about PHP 200.00 with almost 4 hours travel time. 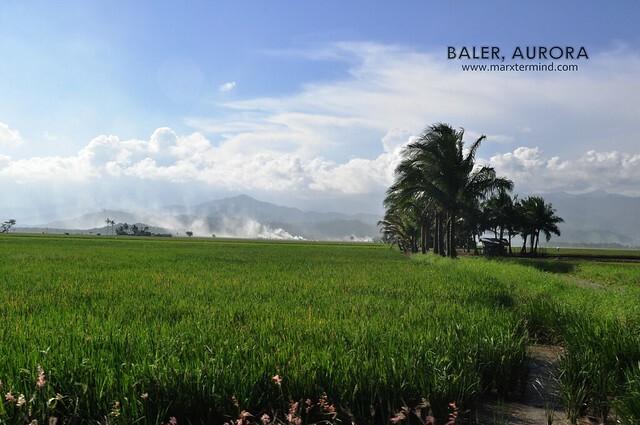 Baler is situated in the eastern part of the Sierra Madre Mountain range fronting the Pacific Ocean. The Sierra Madre is said to be the longest mountain range in the county. It starts in the north in the province of Cagayan and ends in the south in the province of Quezon. The mountains made our entire trip very cold, feels like we’re in the Mountain Province. There were some passengers on top of the jeepney which made me think of doing top loading again but then again the coldness stopped me from doing it. I think I wouldn’t be able take the coldness. It was a long bumpy ride. The road was so dark. I can only see few light posts on the road which I think the government should work on to. Touchdown Baler. We reached Baler at around 6:00 AM. People are starting to come out from their houses and do a living. I can feel the province weather in the surroundings. The feeling that I often missed when I’m in Metro Manila. Sleepless and tired, I contacted our home stay if we can now get in as early as 6:00 AM so we can at least take a rest before going on a tour around the municipality. Resorts and lodgings in Sabang Beach, Baler were already fully booked that time. With no more options left, I searched for home stays in Baler. I texted a few on the list I’ve found in the internet but only one replied to my inquiry, Vincent Gonzales. I’m not fond of calling lodgings or hotels for room inquiries, I just text them and I think for me it’s enough. If hotels and lodging really have the drive to get customers, then they must have time to reply even on a text inquiry. 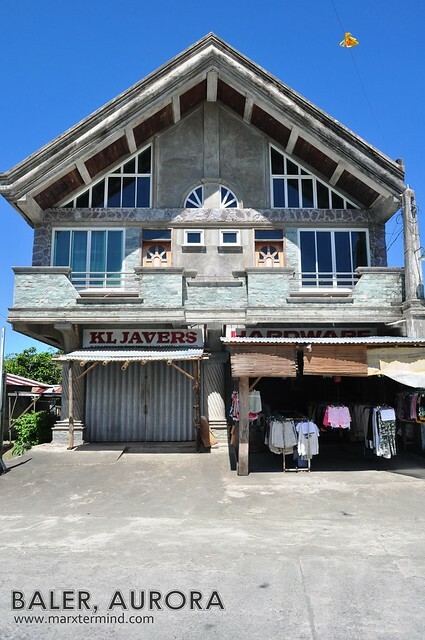 Moving on, the home stay doesn’t have an official business name or some sort but it is located at KL Javers building, Bgry Suklayin, Baler, and so I named this home stay as KL Javers Home Stay. It is located near the public terminal and public market of Baler. It’s also just 5 minutes tricycle drive to Sabang beach. We waited outside the building until Kuya Vincent arrived then took us inside the house. I was feeling shy at first as we entered their home since we’ll be staying in a house owned by a strange family but then again it’s a new experience. The house has two floors. Our room which is good for two persons is located on the ground floor while the other two rooms which are bigger that can accommodate up to 4 to 6 persons is located on the second floor. 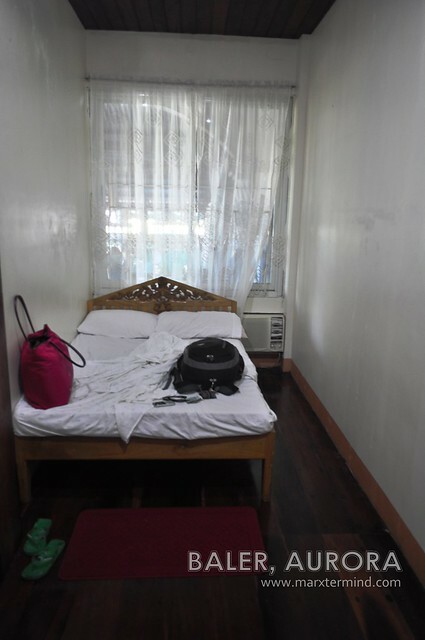 Our room is an air conditioned standard room which costs PHP 800.00 per night. 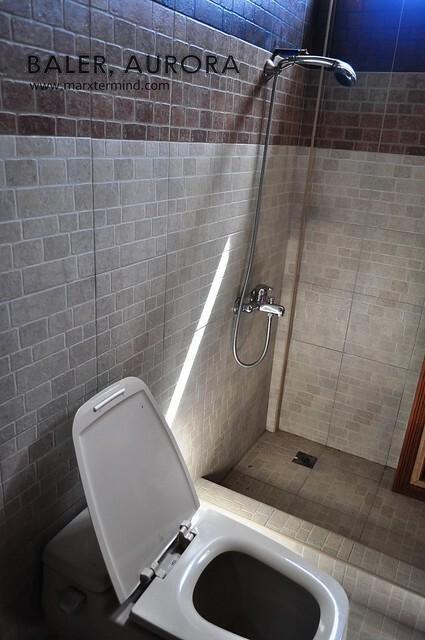 There are two bathrooms available which are shared for all occupants. Like everyone else, I’m somehow particular with bathrooms but don’t be worried as this home stay’s washroom was clean and tidy. I took a peek on how the second floor looks like. There’s another washroom but that doesn’t seem to work yet. 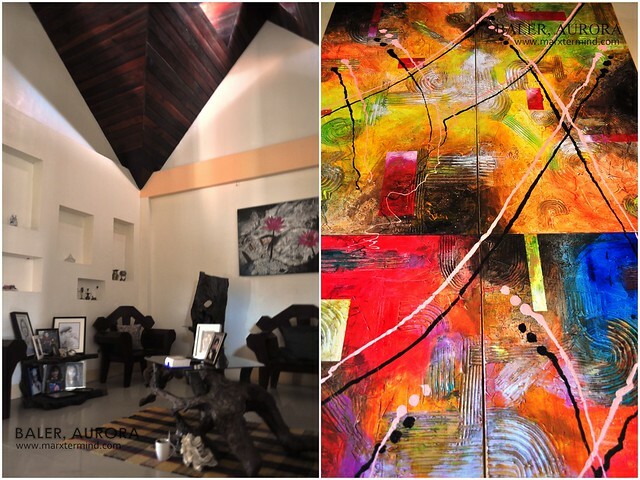 The owner is a painter which explains the various artworks inside the house. Too bad I wasn’t able to talk to him about his works. You can also cook your meals in the home stay with a minimum fee. The family who owns the house was very accommodating and helpful. They even help us find a tricycle driver who will be touring us to different spots in Baler and nearby the municipality. What can I say, the home stay experience was incredible. It was a safe and comfortable stay indeed. It feels like home. If you happen to stay on this home stay, please say Hi from me to the Gonzales Family. the CR looks tidy. love love the artwork. Tama! Ang dilim pa ng daan. maganda. at bagong bago pa ata. Great find marx. pag naisip kong magsurf (kelan kaya yun? hihihi! ), kontakin ko rin sila. Hindi ko kinaya ang 4 hours jeepnewy ride nyo. Ang sakit sa pwet. hahaha!